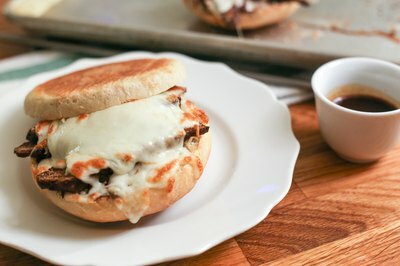 Elevate a simple roast beef sandwich into a hearty French dip sandwich by piling the beef high on a crusty roll and serving it with warm au jus. These meaty treats were invented in 1918 when a worker making a beef sandwich accidentally dropped the roll into a pan filled with gravy. Although you can take shortcuts by using canned soup or deli meat, making most of the components at home lets you control the quality of the ingredients while maximizing flavor. Although you can take a shortcut by warming thick slices of deli roast beef, roasting it yourself is simpler than you may think. 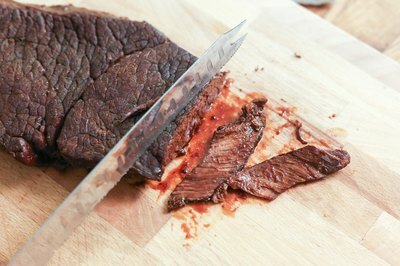 Choose your favorite cut of beef, such as boneless top round, chuck, rump roast, sirloin tip or eye of round. Rub the roast with olive oil and season the exterior to taste with salt and pepper and any herbs or seasonings you like. Roast the beef until its internal temperature is at least 130 F, or medium-rare or 140 F for medium. Remove it from the oven once it reaches the desired temperature, tent it with foil and let it rest for approximately 20 minutes before carving. You can make a decent French dip using canned jus or condensed soup, but if you’re interested in making an outstanding sandwich, homemade jus is the way to go, especially if you're roasting the beef at home. All you need is the drippings from roast and a little red wine and beef stock. Skim most of the fat from the drippings, add some beef stock and bring the mixture to a boil, scraping the bottom of the pan to loosen any browned bits. Use roughly 1 part dry red wine to 2 1/2 parts beef stock. 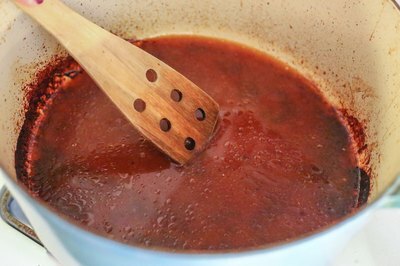 Simmer the mixture for 15 to 20 minutes or until it's slightly thickened and reduced by approximately half. While you can save time using store-bought rolls, all you need to make your own rolls is a food processor and a few ingredients. Combine 1 1/2 teaspoons of instant yeast and 2 teaspoons of salt for every 3 1/2 cups of flour. While the dry ingredients are mixing, slowly add 1 cup of warm water, mixing until the dough forms a ball. 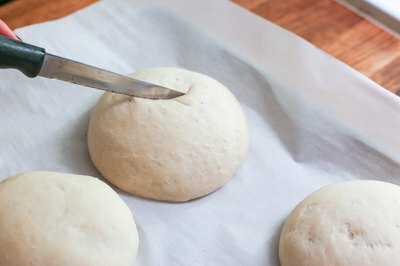 Then, cover the bowl and let the dough rise for an hour before shaping it into rolls. Place them on a lightly greased baking sheet and let them rise again while you preheat the oven to 400 degrees Fahrenheit. Slash the top of each roll, turn the oven temperature down to 375 F and bake the rolls for about 15 minutes or until they’re golden. Cut the rolls in half and butter each side. Place the buttered rolls with the cut side facing up and toast them in an oven that's been preheated to 400 F for approximately five minutes. Dip the bottom half of your roll into the au jus, if desired, before piling on thinly sliced or shredded roast beef. 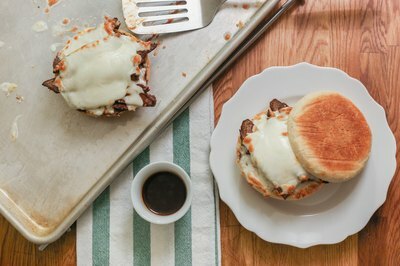 Keep it simple with just beef, or top the beef with sliced provolone or mozzarella pop the bottom halves under the broiler until the cheese is melted. Place the top half of the roll on the sandwich and serve with warm au jus and spicy mustard on the side. Other optional toppings include caramelized onions or cooked bell pepper strips.